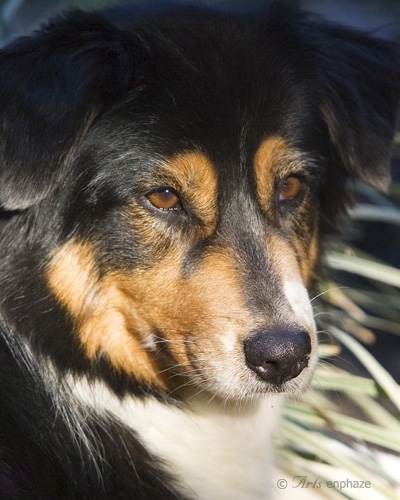 The breed standards state that Australian Shepherds can come in some combination of two basic body colors (black and liver), one pattern (merle), and two trim colors (white and tan.) Of these, the pattern merle is described as two “colors”: Blue merle and red (liver) merle. The base color (black or liver), merle, tan, and white are all distinct genetic traits and breeders need to understand how they are inherited. Black is dominant to liver, therefore a liver colored dog (whether merle or not) can only plas along genes for liver and when bred to another liver-colored dog all resulting puppies will be liver. A black dog, on the other hand, may produce puppies of either color if it happens to carry a liver version of the gene, referred to as ‘red factored”. Those with no liver version will never produce liver colored offspring. You can determine whether a black dog is red factored several ways: If it has a liver parent or offspring, by doing a DNA test or by breeding it to a liver colored dog to see if you get liver puppies. 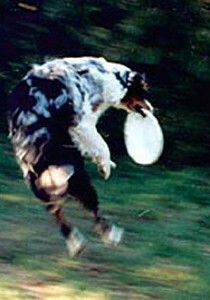 A blue merle is a black dog with the merle pattern; a red merle is a liver dog with the merle pattern. All the merle gene does is determine whether or not a dog is merle. This gene is an incomplete dominant. 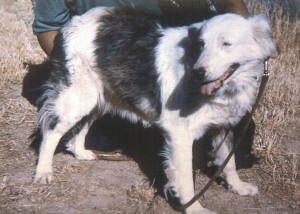 Two dominant copies produce a “double merle” which will most likely have serious eye defects and may be deaf. Two recessive copies result in a dog that is not merle. One of each is a normal merle, a state midway between the two homozygous forms. Tan points are caused by one of several versions of a gene called agouti. Only two of these are contributors to normal Aussie coat coloration, the one that causes tan and another that gives no tan. Most Aussies have two copies of the tan version of this gene, though it is possible that some Aussies without tan may have two copies of the recessive version. 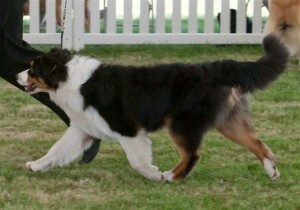 Most Aussie breeders learn early on that breeding merle to merle can result in defective pups, most of which will have excessive white per the breed standard. Merle is our breed’s signature color. In view of this the framers of the ancestor of all current breed standards wanted to discourage people from breeding merle to merle or breeding animals with a lot of white trim which might be double merles. With a certain amount of tinkering, largely catering to the show ring fashion for full white trim, these provisions have remained in the standards in use today. There has long been a myth circulating that more white automatically means more problems. Interestingly, the amount of white even in homozygous merles does not correlate directly to severity of defects. However, dogs with white on or around the ears have some risk of being deaf in one or both ears. Pink skin on noses, the top of the muzzle, on eye rims and other exposed areas of skin are subject to sunburn and have a potential to develop skin cancer. Most double merles with white on or around the ears are deaf, usually in both ears. Occasionally, Aussies that are not double merles who have these markings will be deaf in one or both ears. One of the two most common unacceptable colors is dilute, usually caused by a recessive mutation of a gene called melanophilan (MLPH.) Dog breeders have log referred to this gene as “D” after the pioneering coat color research of Clarence Little in the 1930s. 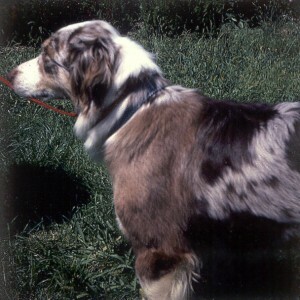 This type of dilute should not be confused with “dilution spots,” which are isolated off-color areas in an otherwise normally colored merle coat. In dilutes, the coat color, whether black, liver or merle patterned, is lightened by the action of a pair of the recessive version of MLPH. Areas that would otherwise be black appear slate blue, blue areas are a significantly paler shade than would occur without the dilute genes. 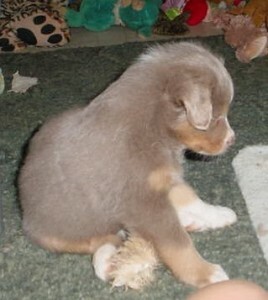 Some dilute Australian Shepherds are born dilute but darken as they mature, often to a point that they are undistinguishable from a normally colored dog. 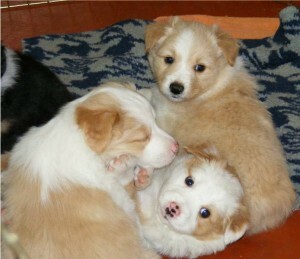 The mutation of the MLPH gene which is responsible for dilute color in a number of other breeds is present in the Aussie. It is a recessive, so both parents of a dilute must carry the mutation. 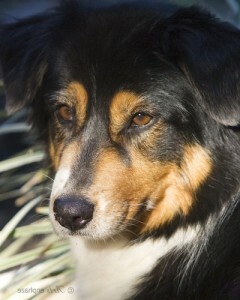 There is a DNA test, however not every dilute Aussie has this mutation. Merles that have them tend to produce puppies that have them, so there is probably some degree of inheritance and that inheritance might pass through non-merle parents in whom it can’t be observed. Dilution spots are not disallowed, but they are considered faulty.